1. Nursery interior design safety considerations. Make sure that you consider baby furniture safety considerations such as placing rockers on rugs and baby cribs away from heaters and windows. 2. Place the baby crib first. 3. Consider practical issues in your nursery interior design. For instance, your rocker should be close to your nightstand and a window if possible. It's relaxing to be able to look outside while you are feeding. Also make sure you can see a clock from where you are sitting. Your nursery hamper should be close to your changing table and your changing table close to your crib. The smaller the distance you have to carry baby after a wet accident, the better. Try to place your crib near the entrance to the room. This reduces the risk of you tripping over things in the night. Avoid placement of furniture across heaters and air conditioners, windows or electrical outlets. 5. Find or establish the focal point of your nursery interior design. This may be a window, the large wall where you intend to paint a mural or the round baby crib you are planning to place in the center of the room. Whatever the focal point, the rest of your baby nursery will be designed around it. Balance does not require symmetry. It can be achieved asymmetrically with pleasing and often more interesting results. Make sure that big furniture pieces are not all at one end of the room; spread out colors and patterns and make sure that you maintain a balance between wood, upholstery and linens. Consider the use of drapes and pillows to achieve this. 7. Consider proportion in your baby nursery. 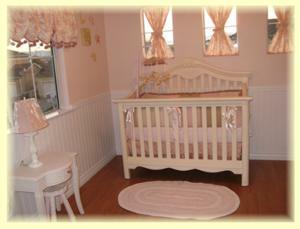 Furniture that looks perfect in another nursery may be too big or too small for yours. 8. Pay attention to line in your nursery interior design. Horizontal lines create a perception of calm. 9. Try out unusual furniture placements including diagonal arrangement. Arranging furniture diagonally across a corner can cause a small room to appear bigger. You can also place a corner table behind the furniture piece for accents such as teddy bears. 10. Divide a long room. If your baby nursery room is long, divide the space by creating furniture groupings, each with their own focal points. Perhaps the baby crib could be the focal point at one end of the room, with a mural or window at the other end. 11. Make sure you have enough space. If you have placed your baby changing table or dresser near the door, keep 40" of space going into the baby nursery to allow opening of drawers without obstructing the traffic aisle. Maintain 22 inches of clear space around the crib. That's it! Above all have fun working out your nursery interior design. try learning how to draw floor plans for your nursery interior design. You can move your baby furniture around on paper until you find an arrangement you like - much easier than dragging dressers and changing tables around the room!